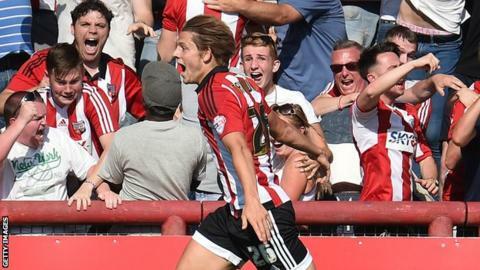 James Tarkowski netted a dramatic 96th-minute equaliser as Brentford scored two stoppage-time goals to draw with Ipswich Town at Griffin Park. Ipswich midfielder Kevin Bru scored a spectacular scissors kick to give the visitors a half-time lead. Ryan Fraser then tapped in shortly after the break to make it 2-0. Substitute Andre Gray raced clear to score for the hosts two minutes into added time, before defender Tarkowski bundled the ball home to make it 2-2. There was little sign of the late drama to come after Ipswich dominated the majority of the game and were kept out by a string of fine saves from David Button. The lively Freddy Sears was denied twice by the Brentford goalkeeper in the opening half, first tipping his weak shot wide before palming his powerful strike away. However, the visitors capped their dominance with a goal just before the break. Fraser, on loan from Bournemouth, cut in from the right and smashed a shot against a post, but the ball fell to 17-year-old Joshua Emmanuel who chipped it back in for Bru to turn home magnificently. After a fine counter-attack led to the Tractor Boys' second, Ipswich continued to press forward and almost added a third when Bru's fierce strike was tipped away by Button. Gray - who was only among the substitutes after being the subject of interest from Hull this week - grabbed what looked like a consolation as he finished coolly from Tarkowski's through ball. Then Tarkowski himself earned a point when he tapped home following a scramble in the box. Brentford head coach Marinus Dijhuizen: "We put a lot of pressure on and took a lot of risks, but we got better and better in the game. "There were big chances, but we couldn't get a goal. Then finally Andre scored. "You think it's too late with a few minutes left, then we sent everybody forward and we got a goal. We got a bit lucky of course, but we deserved a draw in the end." Ipswich manager Mick McCarthy: "It's an annoying one and we should have won. We conceded two really poor goals. "There were chances at both ends and we had the majority of them. We scored two, but should have scored another to put it beyond doubt. If you don't, you don't concede two goals like that. "I'm really delighted by the way we played, I thought we were terrific. It's a shame that three minutes at the end annoys you like that." Match ends, Brentford 2, Ipswich Town 2. Second Half ends, Brentford 2, Ipswich Town 2. Goal! Brentford 2, Ipswich Town 2. James Tarkowski (Brentford) header from the centre of the box to the top left corner following a corner. Corner, Brentford. Conceded by Jonathan Douglas. Attempt blocked. Philipp Hofmann (Brentford) left footed shot from outside the box is blocked. Assisted by Harlee Dean. Goal! Brentford 1, Ipswich Town 2. Andre Gray (Brentford) right footed shot from the centre of the box to the bottom right corner. Assisted by James Tarkowski. Attempt blocked. Jake Bidwell (Brentford) right footed shot from the right side of the box is blocked. Attempt blocked. Jota (Brentford) left footed shot from outside the box is blocked. Assisted by Toumani Diagouraga with a headed pass. Corner, Brentford. Conceded by Daryl Murphy. Corner, Brentford. Conceded by Luke Chambers. Attempt saved. Andre Gray (Brentford) header from the centre of the box is saved in the top centre of the goal. Assisted by Alan Judge with a cross. Corner, Brentford. Conceded by Freddie Sears. Attempt missed. Alan Judge (Brentford) left footed shot from the centre of the box is too high. Assisted by Andre Gray. Attempt missed. Akaki Gogia (Brentford) right footed shot from long range on the left misses to the left. Assisted by Jake Bidwell. Attempt saved. Lasse Vibe (Brentford) right footed shot from the centre of the box is saved in the centre of the goal. Assisted by Andre Gray. Jota (Brentford) is shown the yellow card for a bad foul. Substitution, Ipswich Town. David McGoldrick replaces Ainsley Maitland-Niles. Attempt blocked. Jota (Brentford) left footed shot from the right side of the box is blocked. Substitution, Ipswich Town. Jonathan Douglas replaces Ryan Fraser. Attempt missed. Lasse Vibe (Brentford) left footed shot from the centre of the box is high and wide to the right. Assisted by Akaki Gogia with a headed pass following a corner. Corner, Brentford. Conceded by Tommy Smith. Offside, Brentford. Harlee Dean tries a through ball, but Andre Gray is caught offside. Substitution, Ipswich Town. Giles Coke replaces Kevin Bru because of an injury. Delay in match Kevin Bru (Ipswich Town) because of an injury. Attempt saved. Kevin Bru (Ipswich Town) right footed shot from outside the box is saved in the top centre of the goal. Assisted by Luke Chambers. Offside, Ipswich Town. Cole Skuse tries a through ball, but Ryan Fraser is caught offside. Attempt missed. Andre Gray (Brentford) left footed shot from a difficult angle and long range on the left is high and wide to the right. Assisted by James Tarkowski.